The Blues continue to toy with their fans’ emotions with back-to-back losses against Chicago and Columbus. This is a busy season for all NHL teams, with schedules leaving little room for regularly scheduled rest days. And yet, Coach Hitchcock refuses to accept this as a reason for the Blues to slow down or “play tired.” Luckily, the team pushed themselves hard on Tuesday (February 10th) against the Coyotes and came away with a victory. No offense to Arizona, but this isn’t a win to get a big head over. St. Louis still needs to maintain a sense of humility, especially with a specific Blue Note missing the beat. Shattenkirk is out of the game. After taking a big hit against the Capitals on February 1st, the All-Star defenseman headed to Philadelphia for abdominal surgery. The League has remained illusive about the specifics of the injury, but it was serious enough for surgery. He’s also labeled “week to week,” but other NHL players underwent similar procedures and remained on IR for nearly two months. Losing Shattenkirk for the next two months could have serious consequences. 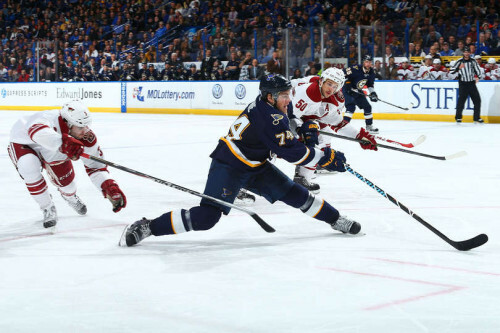 Other defensemen like Bouwmeester and Gunnarsson will need to step up to the ice, and make those minutes count. Barrett Jackman has had a consistently good season so far, so as long as he can be the leader his defense will need, there’s no reason the Blues can’t get back in front and snag a few wins. Jori Lehtera is returning to the ice, taking his place on the line with Schwartz and Tarasenko. His return should help the Blues offense in their upcoming games, as this line has proved solid in previous games. Lehtera is already a fan favorite and he’s turning into a Blue Note worth watching on the ice. His return does push Stastny back a line, but the hometown kid is so easy-going, he can adapt to anything. Fans can only hope Shattenkirk recovers quickly (duck tap fixes everything right?) and returns in time for the games leading into the playoffs, and the rest of the team can fill in the holes until that time comes.